First this is a 'living document'. What do we mean by living document? Essentially as the game grows and evolves, so will this post. Any major/additions changes and I will re-post to the usual places but I don't think any feed sources will update. Purpose: A reference/guide for players of Mobile Frame Zero series about scale, sizes and standards. This isn't official but pulls info heavily from the Hanger (MF0 forum) via discussion and/or 'word of god(s)' and sometimes my own crazy thoughts. Scale: a comparable value of in game size compared to our real world. The scale size is referring to how big is a human at this scale. Size: rough size limits of a build given the scale of your game. Standard: a suggested default or a possible assumption of limits. 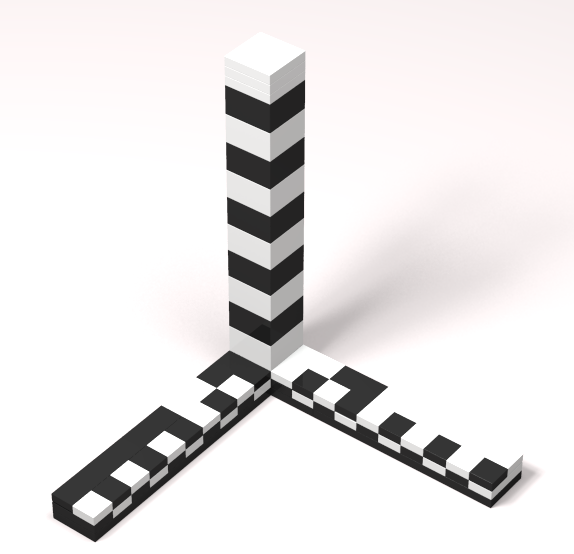 You and your friends can set any scale/size for your games but some choices might cause you to have to tweak the rules when it comes to ranges. In the community we generally refer to scale by plates (as in the smallest height of LEGO) with a number in front to indicated how many plates for example 7p. What is this referring to? People. 7p plates is roughly equal to a person (or 6p, or 4p, that is how tall people are). Why do we care about that? Well, it effects the look of your cover/stations. With the reference of how big a person is (you), you know how to build everything else in relation to that. What about Size? Well, we are talking about the volume that your frame takes up and out point of reference here for measurement is a stud for width and depth while using a brick for height so 10 stud (wide) x10 (stud) deep x 12 bricks (tall). We refer to this simple as The Box. Why this box? Well the best two reasons I can give is 1) the rules work well with your frames not breaking the Size suggestion and 2) This is the general assumption Soren used when making the iconic MF0 frames. As for 1) I mean, the bigger you get out of the box the easier it is to get shot while gaining no real benefit besides look factor. So at 7p Scale using the The Box the rules work very well and you have a nice scale to work with when it comes to building stations and your cover. As we discussed above 7p is how tall a human is on the battlefield but what does that mean to everything else? Let's basic down to the most basic by starting with average human height at 5'10" (1.8 meters) but lets just round that to 6' (1.8 meters and humans will be taller in the future anyways). 6 feet/ 7 plates equals 0.86 feet ( or just over 10 inches, 0.26 meters. I say 10 inchs or 0.25 meters for simplicity.) per plate. So there is the low end, but let's take this to another common reference in the game: the chub. The chub is roughly 21 plates tall meaning it is a rough 18 feet tall or three times taller then the average human. That seems about right and fits well into the default setting for MF0 (of course feel free to make your own setting). So we have people, the plate, the chub but what about THe Box? (a lot of adjusting is about to happen to keep math easy) The brick is 3 plates tall and just over 2 plates wide giving as a rough height of 30 inches or 2.5 feet (0.75 meters) and a width of 21 inches or 1.75 feet (0.50 meters). That makes The Box 17.5 feet (5 meters) long x 17.5 feet (5 meters) wide and 30 feet (9 meters) tall. If your interested in smaller scales such as 4p and below then you should checkout No B.S. Just A.B.S. 's entry about Scale as well. @Shades_Corvid A minifig with a hat or hair would come out just right, then! Your other scaling makes sense to me, too. 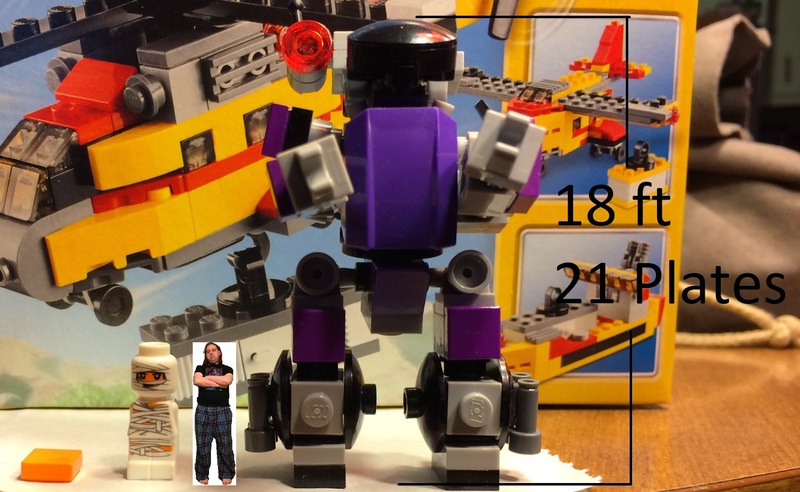 So I sized up the minifigure (12 plates) and started the math to figure out the scale and how things would need to change. Short answer is it got complex and what I would call silly. So I came up with this instead. 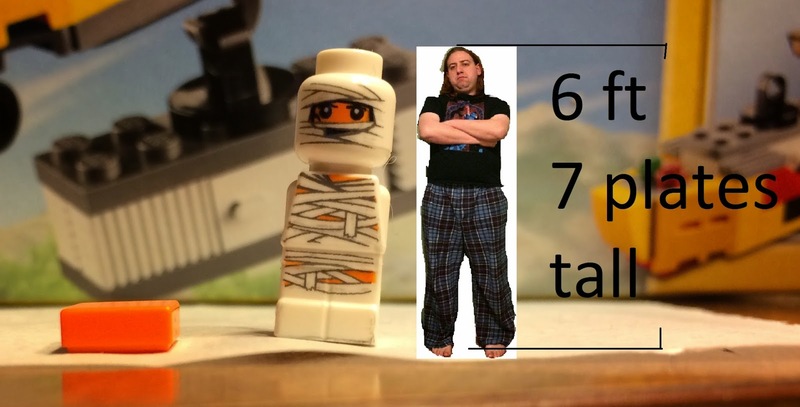 Just double the scale and everything else then just call it minifigure scale. 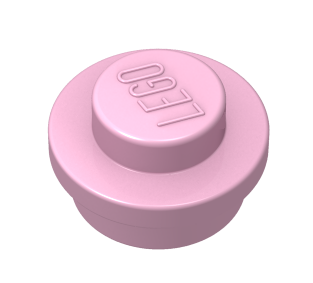 So yes, 14p scale(5 inches per plate) is what I think minifigure scale should be with the minifigure is two plates short just like the microfigure is one plate short. With that though everything needs to double as well. 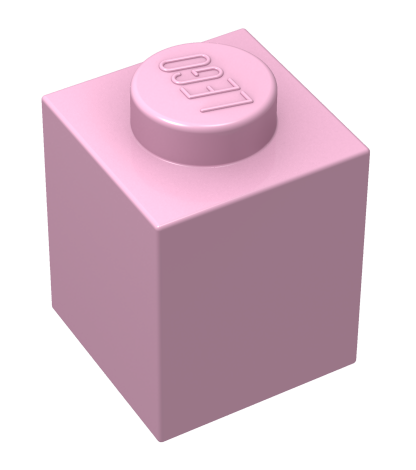 Minifig Standard Scale: 14p, 20 studs x 20 studs x 24 bricks suggest max size. 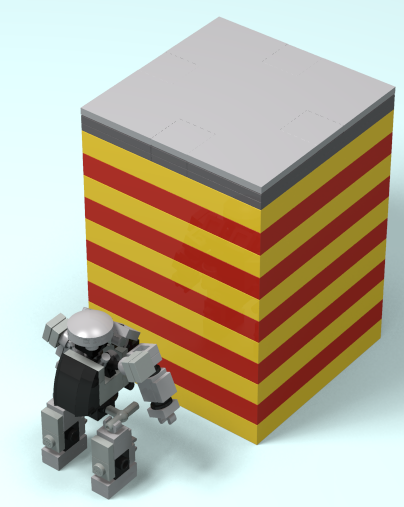 The Ruler: Still 8 units long but unit is now 10 studs long. With that adjust play area (about 9 feet wide) and ranges with that in mind. Cover: Now Begins at 6 bricks or higher. Stations are still not cover. Stations: Stations are now 8 studs x 8 studs. 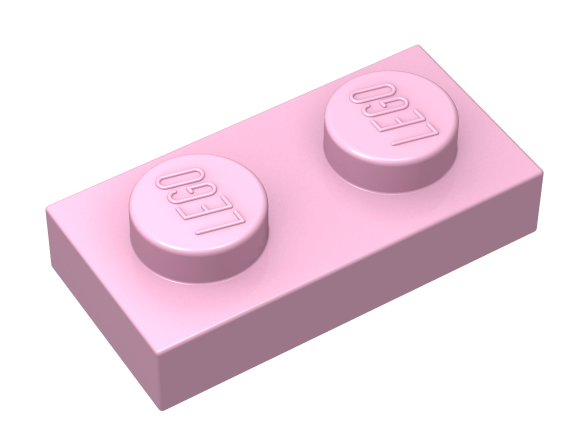 Cover Damage: Remove 12 pieces instead of 6 and I would stick with 2x2 brick as your common minimum size of piece and have 1x1 bricks used sparingly. 14p on the left, 7p on the right. The top of the open hatch should be equal to a 14p Chub. You can follow Dark Cloud Blogs on Facebook, Google+ and Twitter. If you just want to follow me (John/Gwynn 'Shades Corvid') you can check me out on Twitter and Instagram. So a while back a friend of mine did a bit of crowd funding to get her first children's book (middle grades) published. To be a good supportive friend I donated at the level that would get me my very own copy of the book (I didn't have the money for the snicker doodles...though I should make her bring me some at our next game night.). After getting past my list of must reads I got to reading her book and have decided to write a review after enjoying it so much (I read it twice.). So I present a book review on Felix the Comet by Cathy Coley! If you like to purchase a digital copy go here. or to give as a gift try here. So the Sellswords concept came from a tweet that inspired many others. I used those tweets as a form of notes to make the previous post. Not every tweet is in there either because it just didn't flow into the writing or twitter was being stupid and I missed it. Sellswords- a guild of escorts, bodyguards, guards, lookouts for hire and their local handlers. Sellswords are not mercs or soldiers. most dislike such terms and try to be deterrents, not killers. Most Sellswords seek handler status or the long duty aka steady pay. also take pride in their chosen weapon. Some Sellsword Handler duties include contracts, community 'n' govt relations and member crash space. The big duty of Sellsword handlers is getting together to organize regional/local special events. Sellsword events serve to recruit, promote, rank up, reorganize (Sellswords) and build relations (with community and fellow Swordswells). Important Sellswords are allied merchants first; allied defenders second. They are their own product. Rumor has it Sellswords went to war twice. Neither was a contract but under their own banner. they refuse to talk about it. Famous Sellsword: Franus, youngest to earn handler, first to carry the title SellVoice, never carries a weapon. Sellswords do have a Bill of Operations and Conduct. Sellswords are expected to help each other if they happen to be present when something goes done; off or on duty. These defense of Sellswords usually earns the defender tips or boons from the Sellsword and/or a handler. Sellswords always get paid, even if the die but the client lives. either the pay goes to family and/or the Sellsword group. Generally it is consider a bad idea to refuse paying Sellsword. legal course is always used first, if possible. Sellsword clients do not have to go through handlers, usually just faster. There is always a contract though. what exciting travelling professions can you think of for a fantasy game? I then responded with a lot tweets over the last few days for a group I call the Sellswords and using those tweets I give you the rest of this post! Sellswords is a guild of elite defenders for hire: escorts, bodyguards, lookouts, guards and their handlers. These are no simple soldiers for hire to fight your battles; just here to protect your stuff or keep you alive. The Sellswords Guild operates under a document that is referred to as the Contract of Operations and Conduct and in which all members carry a signed copy. The following is just a summary of its contents. Seems a bit obvious but; Stay Alive, Get Paid, and Master your weapon but here are some other ways to look at it. Sellswords are merchants whose wares are their ability to keep people away and put a weapon to fantastic use; not a soldier or a killer. The fight prevented is a battle won. Contracts make sure you get paid. None; Sellsword have no governing head figure. Handlers work together as needed to run things on various levels be it international, nation, regional, local or personal levels. Even then there is no formal council of handlers; just people discussing what needs to be done. In certain situations handlers will call for a vote and of course certain handlers take on my 'leader' roles created out of necessity, ability or situation. Simply put Sellsword Guild asks you to join, not the other way around. This is usually done by handlers during an organized Sellsword Event where they usually have some kind of tournaments open novices or anyone in general. The other time a handler or a well respected member (with handler approval at SOME point) will find someone they see potential in and bring them into the fold. Of course skill in arms is only a fraction of what they are looking for and not all recruits make it to claim the title of Sellsword. Sellswords have a ranking system in which members call titles. Upon gaining title a member is presented with a badge (most of the time publicly) indicating their title level. These badges are usually displayed constantly on person as this is a potential tool a member can use. Privately a member is given a token that goes along with the new rank; the token is how members prove to one another who they are given badges can be counterfeited quiet easily. Most of the time old tokens and badges are turned into handlers to be used again for the next rising Sellsword. Recruit - The training and learning step. No badge, no token; either working under a Selltitle or a Handler. If under a Handler they will be assigned contracts working with other Sellswords that will report back progress to the Handler. If your not going to make it, it will usually happen here. Sword - Usually the shortest chapter for most Sellswords, your first badge made of copper and a wooden token. This is the true proving grounds as you will be given contracts unsupervised either on your own or working with fellow Sword titlers. Can still wash out. Badge looks a square plate with a sword going across it. The token is a bar with a sword on top and special inscription on the sides. Sellsword - Full member of the Sellswords with Iron or Steel badge along with silver token. The wooden token is usually burned by the new Sellsword as a symbol of moving on from one's past into one's new future with the Sellswords. This badge is a round shield with a sword going across while the token is another bar, again with a sword on top and a different inscription on the sides. Selltitles - The Elite of Elite though depending on what is going on Selltitles could out number Sellswords in a region or even over all. The actual title replaces the word title with the members specialty of combat, style or focus of duty ie SellShortsword, SellArcher and SellWall. Selltitles are proven contract completer and have proven there skills at many of Sellsword Events. A new Iron or Steel badge but made to fit your new title, still usually a shield with something across it. The new token is now gold bar with the sword on top with a different inscription on the sides. Handlers - Many Sellswords leave or retire from the guild without becoming a Handler as it is a duty along with being a rank. Most of the time it takes a new region or city and votes from handlers to raise a Selltitle to a Handler. Odd situations have caused the rise of a Handler as well. One example could be a Handler suddenly dying and a member of the guild steps up handling the duties of a Handler. The word will spread and the surrounding handlers will make formal what is already going on. A steel badge similar to their Selltitle but with a H in the background or the equivalent in the Handler's native tongue. The token is same as before made out of platinum. Retired - Not a rank but just a fact. Once a Sellsword they are done with the duty, the usually in form local handler(s) and move on with their life. They keep their badge and bar but no longer display their badge. Some go in and out of retirement. Try to maintain good relations. You always have the right to defend yourself. The best victory is the one obtain without drawing your weapon. Defend your fellow Sellsword, on or off contract. If defended off contract, it is good practice to give boon or tip. Tip Handlers for Crash Spaces if possible, Handlers get a cut of Contract Pay if they set it up. Provide Crash Space for Sellswords. Maintain good relations with local communities, govt, local law enforcement and other groups. Plan and run one at least Sellsword Event per year. To help relations with communities, build reputation and give a change for Sellswords to properly gather for various reasons Handlers put on special events. They can range from simple combat demonstrations to the public in front of a Crash Space to grand region fairs. Contract: Jobs and the written down arrangements for the job. Boon: A favor granted to a fellow sellsword, sometimes written into formal contracts. Tip: Money freely given to a fellow sellsword, usually no records for such a transaction. Crash Space: A place ran by a handler to give sellswords a place to eat, sleep and get guild info between contracts. Usually where sellswords go to get contracts from handlers and where clients go to contract said handlers to arrange contracts. Furan; youngest recorder Handler, first to earn the title SellVoice and never carries a weapon on person. Sellwalls; heavily armored Sellsword team that are almost walking living forts. Raniers; SellArcher and Handler. Operator of Outpost SellGreen. SellGreen: An Outpost that serves as a safe haven in a middle of trade road that runs in untamed, barely explored area. It acts as inn, tavern and general store for travelers and those few that operate in the region. With a flash of your token gains you access to the private crash space and discounts at tavern and store...even perhaps access to exclusive equipment. This was made for everybody! If you like what your read, please put it in your game if you like. Modify it to your desire, put in your details. Some things to think about: Do Sellswords have casters?, Are the Sellwalls a pair, a large party or even a sub guild with their own handler? I am not opposed to seeing Sellswords in some kind of RPG document (it be insanely cool to be truthful); just give me some credit and super small cut if you make a profit?